Free Better Images and Photos. “Picture Speaks Thousand words”, this quote is so true to its words. I agree in total that a picture can give more information than that of words or paragraphs. The most interesting part of a picture is it does not need any language to interpret, one qualify with their eyes alone. When you are author of a blog or designer of website or social enthusiastic user you always are in hunt for Images. Pictures and Illustration are one which helps to portrait or gives information to people in your media. Images are undoubtedly integral part of any website or blog. If you look at 9lessons itself I explain all my tutorials with more images in it. Well it is not only important for getting the right image or illustration for your website or blog, it equally important to get the best image quality and huge store where you can choose the right image for you. I was in hunt for one such shop where I could find a professional images, sharp image quality, option to download different image sizes and choose from a huge repository. Well after a quite a research and googgling around I did get what as I wanted and instantly got impressed with Depositphotos.com. So here I am to give you a review on Depositphotos.com and why I think you should love it too? 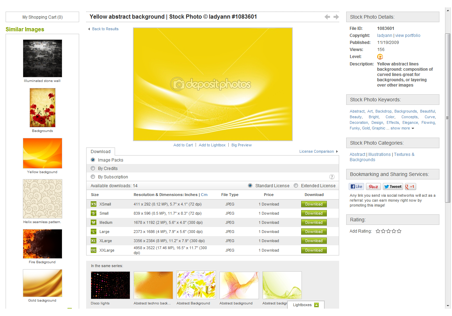 Depositphotos is a website which help in buying and selling royalty-free images (like photographs, and vector images ). It is a very resourceful and convenient tool for designers and users who are in need of images for their respective usability like blogging and designs needs. It is also a useful tool for professional artist, designers and photographers to sell their work using this portal. Category: All the Images are categorized into different section helping one to browse through the images as per need. 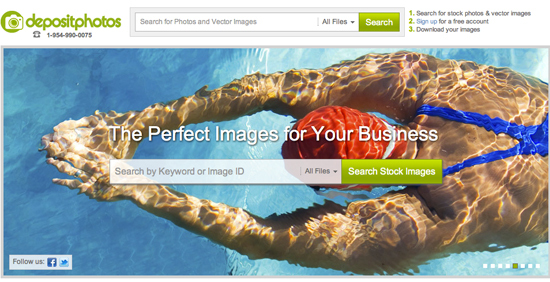 Search Images: Option to search images by any keyword and option for advanced search. The advanced search option is flexible form based input system, but of the entire most impressive feature for me was Filter Images by colour. Just to have a test I used the color “Yellow” and result did return me images with shades of “Yellow” color. Simplicity: Clean design and nice fonts. All the styles, Layout and heading used are consistent across the webpage. 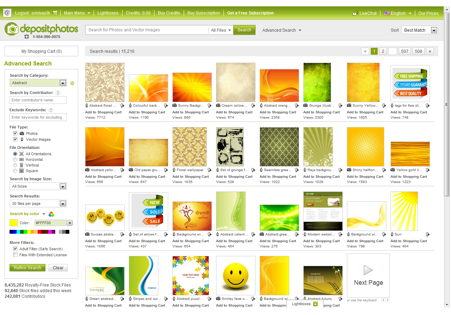 Colour Effects: The entire web site is used shades of green, quite impressive and soothing to eyes. Evoking Emotions: The slide show in the home page is catchy and has been used with impressive pictures with lot of emotions invoked in it. Which promises that the website had got lot sharp and high resolution pictures. Responsive Web Design: Impressed about this, I am person who is always in a go and depend most of work on my IPhone. Websites adapted to Responsive web design is quite impressive take in my point of view. Bandwidth: The website deals with high resolution images and presentation of lot of different images. It is amazing that it deals quite well with the loading response time which is as quick as any text based forums or website. Browser: The website is consistent across browser. I did run through IE, Firefox and Chrome browser. Image Authors Registration: The website allows to register Photographers and designers interested to sell their images. They have a brief selection process of the photographers which makes as sure they always hire top level authors to publish their images and all the users get the best images. Plan and Pricing: The plans and pricing are very clear and reasonable as compared to other top notch royal free image websites. The have a 7-day free subscription plan which is useful and if you are not satisfied with the service you can pull back anytime. Download: Once you have selected your image. You will have redirected to the downlaod page giving you various option to choose the quantity, size and resilution of the images. Lighboxes: Lighboxes option is like folder where you store all your favourite images and you can also share this “Lightboxes” across your social connection. The above discussed are some of the features which I found quite impressive. Depositboxes proudly have an huge repository of image ( 8+ million) in their store and 1000+ images getting added by professional photographers and designers from across the world. The current Alexa Ranking for Depositboxes is 2073 which is remarkable. This is an excellent thing . . . .
after a long time i see new post on your website.. your big fan..
Nice Advertisement, but it's not free. Iconfinder.com is another good resource for free images of many sizes. Wow... It's a one of the great resource for every web designer. Thanks for sharing.